Dr. Roger Weikum earned his Doctorate in Optometry in 1974, graduating from the University of Houston College of Optometry. 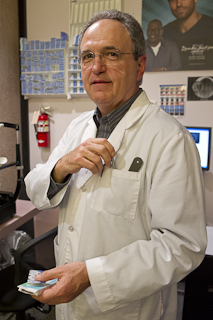 Dr. Weikum is a Therapeutic Optometrist and has done post- graduate work in ocular therapeutics and glaucoma. He is licensed in the treatment and management of eye disease, infections, eye allergies, injuries, and an alternative to Lasik surgery – Corneal Mold for myopic reduction. He also specializes in the fitting of all types of prescription eyewear including eyeglasses, contact lenses, computer glasses and sports glasses. Dr. Weikum is a member of the American Optometric Association, the Texas Optometric Association, Dallas County Optometric Society and the specialized group of First Eye Care doctors. Dr. Weikum grew up on a farm in Elgin, North Dakota as one of six sons. He and his wife, Jan, enjoy spending time with their three sons, daughter-in-laws and grandchildren.